Come on down to Ramseyer Farms and enjoy the day exploring two giant corn mazes, meeting our farm animals, racing your friends around our pedal cart track, taking a scenic hayride around the farm and through our woods, and making memories trying over 45 family fun activities in a beautiful country setting. If you haven't already, it's time to make Ramseyer Farms your new favorite fall tradition! Tickets may say September 3rd on them because that is our starting date, but they can be used throughout the entire season. Children ages 2 and under are free. 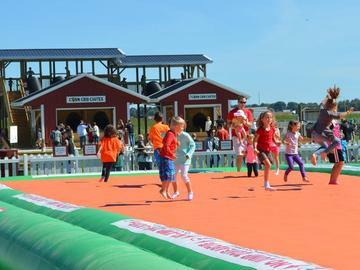 Admission is required for anyone 3 years and older to enter our farm activities area. To get more directions click the "Get There" tab. All sales final. No refunds or returns. All information collected is used internally only. Information is not shared or sold. For questions visit www.ramseyerfarms.com or email info@ramseyerfarms.com.